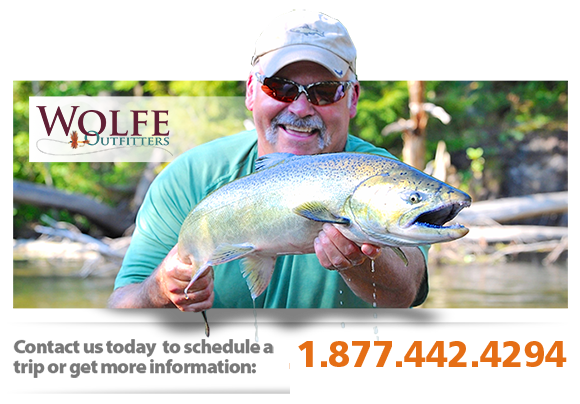 Wolfe Outfitters is a full-service fishing outfitter located in northwestern Michigan. We offer a wide range of waters to fish: area rivers, inland lakes, or even Lake Michigan. Our knowledgeable and friendly guides help to ensure that each trip is a fun and memorable one, in a relaxed atmosphere tailored to each customer's needs. Our fly fishing and light tackle guided trips are run from drift boats, river jet boats, and a larger custom-built center console able to fish the big waters. We also offer guided walk-in wading trips on select waters. Wolfe Outfitters' fishing guides are fully licensed and insured, and provide instruction, expertise, and the right attitude and experience to make sure you have a great day on the water. Book your guided trip for salmon, steelhead, trout, smallmouth bass, largemouth bass, lake trout, carp, and pike on the Manistee River, Betsie River, Platte River, Pere Marquette River, Au Sable River, as well as area lakes including Betsie Bay, Crystal Lake, Platte Lake, and Grand Traverse Bays. We also have the only guide outfitter permit to fish inside the Sleeping Bear Dunes National Lakeshore, giving our customers access to a world-class fishery for several species in a setting that was voted as the "most beautiful place in America" by Good Morning America in 2011.